Huawei has completely blurred the lines between its signature Mate and P series by raising the bar higher and higher every six months. 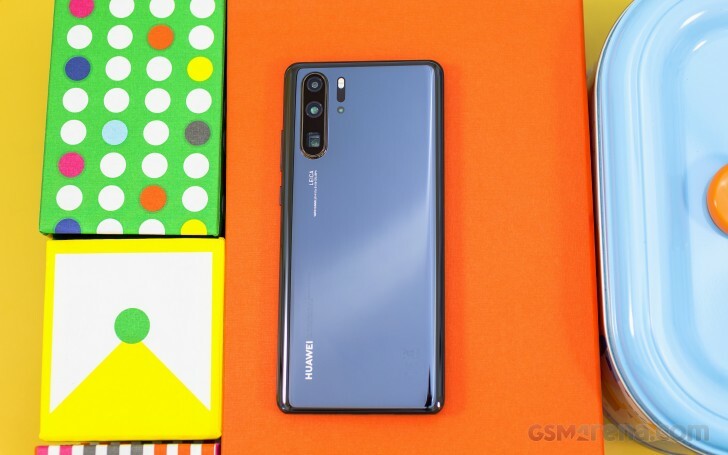 And it has done it yet again with the Huawei P30 Pro - now with an even larger AMOLED screen and a brand-new quad-camera setup that aims to become the new benchmark for the whole industry. Just as expected the next smartphone Leica camera premieres on the Huawei P30 Pro and now it's a quad-setup. But Huawei hasn't just added a ToF sensor and call it a day. Instead, the maker made upgrades across the board - the main snapper has a new 40MP sensor by Sony with improved low-light performance and optical stabilization. Then Huawei has upped its own game and has introduced an innovative periscopic lens to achieve 5x optical zoom on its 8MP tele camera. The so-called hybrid zoom is available and it's now 10x, with an option to go as high as 50x - all purely digital, of course. The third camera is borrowed straight from the Mate 20 Pro - a 20MP snapper with 16mm ultra-wide lens and autofocus. The fourth and final camera is the aforementioned ToF unit, which promises to take the portrait shots up another notch. The selfie fans aren't forgotten - the front camera is now a 32MP one, with AI HDR+ and improved portraits. It still lacks autofocus, sadly. The selfie snapper occupies the tiny notch on the new 6.47" AMOLED screen. The panel itself sticks to 1080p resolution and has an under-display fingerprint scanner at the bottom, and also doubles as an earpiece. That's right, the whole thing is now "acoustic" and vibrates to create sound and thus there is no need for an actual earpiece. Other niceties coming straight from the Mate 20 Pro are the 40W Super Charging and 15W wireless charging support, as well as the reverse wireless charging. The other good news is the P30 Pro is IP68-rated for dust and water resistance. Just like the Mate 20 series, the P30 lineup adopts the smaller proprietary NM card expansion option with all the positives and negatives that entails. Finally, the P30 Pro boots the latest EMUI 9.1 based on Android Pie. The phone uses Huawei's new EROFS file system though, which should offer much better read speeds. 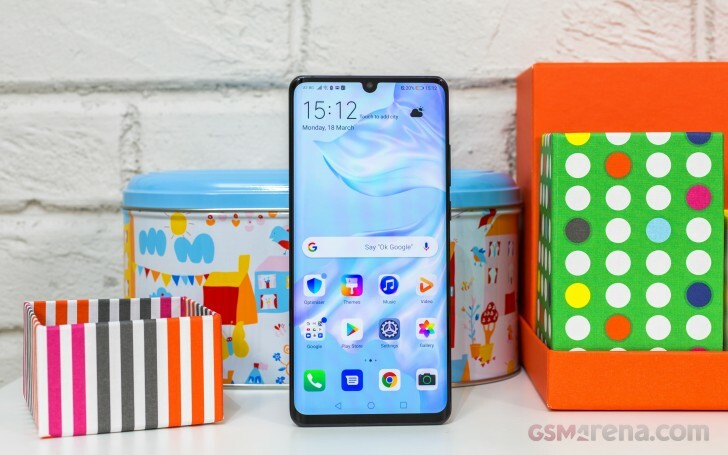 But before we dig into all those details and technicalities, let's pop this P30 Pro out of its box. 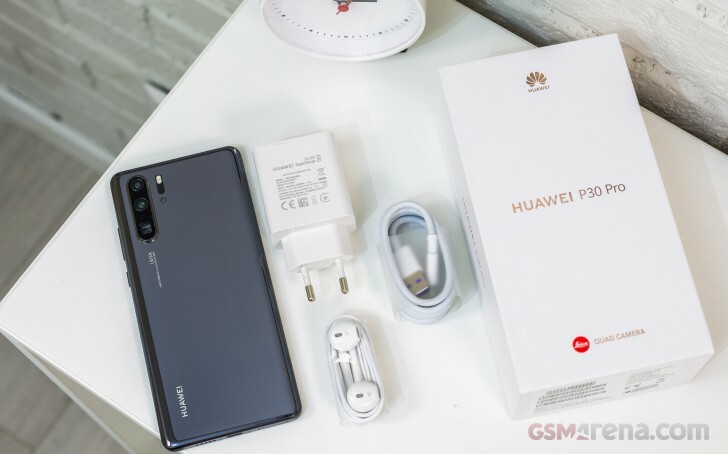 The Huawei P30 Pro is packed in a mid-sized paper box with a 40W charger, an enhanced USB-C cable that works with Super Charge, and an EarPods-like headset. Some markets will also get a protective case. Unfortunately, the P30 Pro won't come with a USB-to-3.5mm adapter as part of its retail bundle. If you need one you will have to either purchase or use one from an older Huawei flagship. thanx huawei but, all what we are asking is some one who listen we love ir blaster we love 3.5 audio jack we love fm radio flage ship phones must have them all heloo any body listing?